The KC-inspired discussion on Rule # 1 Investing (thanks, KC!) has prompted me to create a new group on Share Your Number, the home of people who want to help others (and themselves) to reach their Number ,,, and, now also the only web-Community [webmunity?] 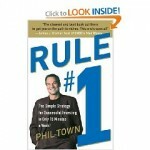 partially devoted to all-things-Phil-Town – well, at least to his book: Rule # 1 Investing. To kick things off, I am sharing some resources (including my very own Rule # 1 spreadsheet!) … so, why don’t you join today?! This entry was posted in Stocks and tagged 7million7years, Investing, Rule # 1, Stocks by Adrian. Bookmark the permalink.